There’s something distinctively North American and Moto about the design cues of the DEXT. It’s fairly chunky, heavy, and features a four row landscape QWERTY slider. It’s definitely function over form and, aside from its weight (163 g), overall Motorola have made some sensible choices. The build quality is solid, and the slide mechanism is both sturdy and smooth. There is, however, a very noticeable gap between the slide-out keyboard and screen when the phone is closed which will bother some, although it’s a trade-off that benefits the QWERTY with raised keys and plenty of travel. With that said, the keys could be better spaced apart, perhaps by shrinking each key a little. Every now and again I find myself pressing two keys at once, but this has improved a little over time. The ‘enter’ key is nice and large and Motorola have duplicated the traditional Android ‘back’ key so that it’s easily accessible when the keyboard is open as well as when the phone is in portrait mode. Rather than the standard Android track ball, the DEXT features a directional pad, situated on the left hand side. It works just fine but I found myself rarely using it because its positioning – it’s only accessible when the keyboard is open – doesn’t support one handed operation of the phone. Overall, the DEXT’s keyboard is definitely better than the Palm Pre and on par with the Nokia N97 but it doesn’t come close to the standards set by the Nokia E71 or BlackBerry Bold. The other hardware controls include a slider switch for putting the phone on silent, volume up and down keys, on-off switch, and a portrait positioned ‘back’, ‘home’ and ‘menu’ button. There’s also a microUSB socket for charging and connecting to a PC – with support for mass storage mode – and a standard 3.5mm headphone socket too. The touch screen on the DEXT is a 3.1 inch capacitive, which is similar in size to the Palm Pre. It’s reasonably responsive and bright, although on a few occasions a finger swipe was registered as a click, as if the 528 MHz Qualcomm processor on the DEXT can’t quite keep up or the touch screen isn’t as sensitive as it should be. Connectivity-wise, there’s WiFi, assisted-GPS, 3G/HSDPA, Bluetooth. There’s also a digital compass and a 5 megapixel camera, which proved to be fairly decent in good light, possibly the best Android camera I’ve tested yet but not in the same league as Nokia and Sony Ericsson’s best efforts. The DEXT packs a 1420 mAh battery, which was able to power the phone for a full day in most circumstances even with MotoBLUR regularly pushing social networking updates to the home screen (see below). Obviously, milage will vary considerably depending on 3G signal strength and WiFi usage etc. The DEXT runs Google’s Android OS, version 1.5 (Cupcake), which is a couple of revisions behind the latest release (2.0). 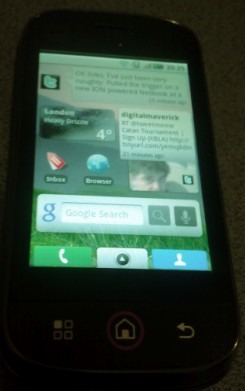 It’s not a Google branded phone either, due to the UI and other software tinkering that Motorola have carried out. The handset maker has, however, licensed all of the standard Android Google apps e.g. Gmail, Google Maps etc., including single sign-in and synchronization with your Google account and contacts. Over-the-air updates are also supported, as is access to the Android Market and the growing library of third-party apps that are available for the platform. However, it’s MotoBLUR that really distinguishes the DEXT from competing Android phones. MotoBLUR is a mixture of UI customization, unified address book, discrete applications, and Software-as-a-Service (SaaS). As I wrote when MotoBLUR was first unveiled, Motorola claims that the combined offering “is the first and only solution to sync contacts, posts, messages, photos and much more—from sources such as Facebook, MySpace, Twitter, Gmail, work and personal e-mail, and LastFM—and automatically deliver it to the home screen”. Of course, that’s not strictly true. Moto isn’t the first mobile player to go down this road, but the PR spiel gives you a fair idea of what the handset maker is aiming for. In terms of the home screen, MotoBLUR consists of a number of additions to Android’s standard widgets which can be placed anywhere you choose across multiple revolving home screens. The ‘Happenings’ widget pushes your friends’ status updates and other alerts, such as friend-requests or event invites, from Facebook, MySpace, Twitter and Last.fm to the home screen. Rather than the DEXT polling each service separately, Motorola’s does it at the server level and then only pushes new content to the phone. This is presumably designed to be more efficient and help preserve battery life. Tapping on the widget brings up a sort of card view with one update displayed at a time and the ability to browse through them by swiping right to left. If you’re following a lot of people on Twitter or Facebook it’s not a very scalable method of navigating updates, therefore you’re also able to open a scrollable list view of all updates. Strangely, however, there’s no way to filter by @ replies on Twitter, making it very hard to track conversations and in this context MotoBLUR is pretty much useless. It’s as if the team that designed MotoBLUR don’t actually use Twitter or at least only superficially. Instead, you’re still better off downloading a third-party Twitter app from the Android Market, such as Twitdroid. 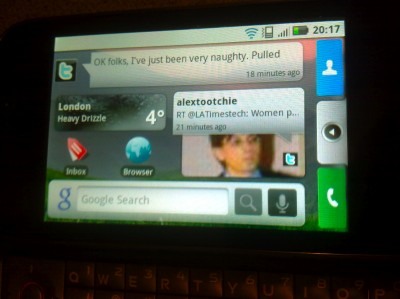 The ‘Messages’ widget lets you send status updates to Twitter or Facebook (or both at the same time) directly from the home screen. Other MotoBLUR widgets include a weather widget and RSS reader for pushing content from blogs, news sites or any RSS feed straight to the home screen. All work really well. But perhaps the most interesting and controversial aspect of MotoBLUR is the unified address book which merges contacts from Google, Facebook, MySpace, Last.fm and Twitter. It’s not a new idea and it suffers from the same problem faced by competitors. It’s all or nothing. Activate support for Facebook, for example, and all Facebook contacts are imported. That’s great for people who you want to have occupying space in your address book but doesn’t scale if you have hundreds of Facebook ‘friends’. The same is also true of Twitter etc. In fact, Twitter is potentially worse, since you may well follow people, such as brands or celebrities, who you have no real relationship with. The only option is to deactivate a service or add contacts that you really care about to a list of favorites. The upside of MotoBLUR’s social networking-savvy address book is the ability to view a friend’s latest updates and content from within their address book entry. More fun still is that when a contact rings, their most current status update pops up on the incoming call screen – potentially invaluable info to help you decide if you actually want to take that call! Where MotoBLUR’s unified approach does scale better is with regards to the phone’s in-box. Direct Messages from Twitter, Facebook etc. are treated the same as SMS or, optionally, email, based on contact rather than service. For somebody like me who relies on Twitter’s DM feature to stay in contact with work coleages or contacts, this is a real blessing. With MotoBLUR, I never missed a beat. MotoBLUR also adds photo uploads to various third-party sites to the phone’s camera app. Facebook, MySpace, Picasa and Photobucket are supported, while Twitter through services such as TwitPic, is sadly missing. 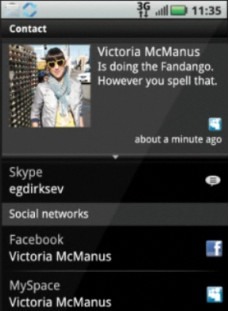 More evidence that Motorola doesn’t quite get the microblogging service. The final aspect of MotoBLUR is that all of your settings and content is backed up on Motorola’s servers. This means that if you change handset to another that supports MotoBLUR or if you need to do a hard reset, you won’t have to start over. It also means that you can do a ‘remote wipe’ if you lose your phone. This is a really important security feature due to the fact that the DEXT stays permanently logged into all the social networking and email accounts that you’ve chosen to activate. There’s no doubting that the Motorola DEXT is a decent smartphone and I really like where the company is heading with MotoBLUR. Even in its current incarnation, it’s really fun and in parts genuinely useful. That said, there’s a lot of room for improvement. The scalability issue needs to be solved as not all social networking contacts are equal. Twitter integration also needs to support the conversational aspect of the service. And while MotoBLUR supports more third-party services than rival handset makers’ own social networking-savvy offerings, it would be a smart move to offer a Software Development Kit (SDK) so that any third-party service can add support for MotoBLUR. Finally, is Motorola back in the game? Based on the ambitions of MotoBLUR and the DEXT’s solid hardware, it’s a cautious yes.